Vanderbilt by Gloria Vanderbilt is a floral and woody fragrance for women. Opening accords of aldehydes, bergamot, green notes, neroli, pineapple, jasmine and orange blossom are followed by a heart of rose, tuberose and ylang-ylang on an oriental base of cinnamon, civet, musk, opoponax, vetiver, sandalwood and vanilla. Vanderbilt is a timeless scent from the 80’s. The floral mix leaves you feeling sophisticated and energized. The gold bottle features the iconic swan; Glora Vanderbilts brand logo inspired by her first stage play “The Swan”, which premièred in the 1950’s. Vanderbilt was launched by Gloria Vanderbilt in 1982. 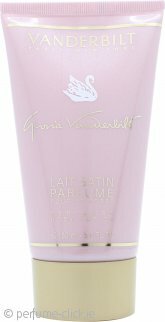 Gloria Vanderbilt Vanderbilt Body Lotion 150mlDelighted Customer! Love, love, love this body lotion. Have been using it for years and find perfume-click is the best place to buy it as it's great value for money!